The Maroons give Slater a fitting send off. Rugby League The Blues couldn’t finish the job in Brisbane but still did NSW proud, with a gutsy display in one of the great contests, writes Matty Johns. Rugby League BILLY Slater’s illustrious Origin career ended in sad controversy when he was hung out to dry by an “absolute joke” at Origin III. 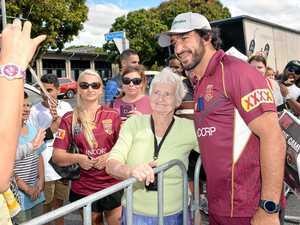 Rugby League COURAGEOUS Queensland summoned every fibre of spirit to deny NSW a clean sweep and send retiring fullback Billy Slater out a winner.